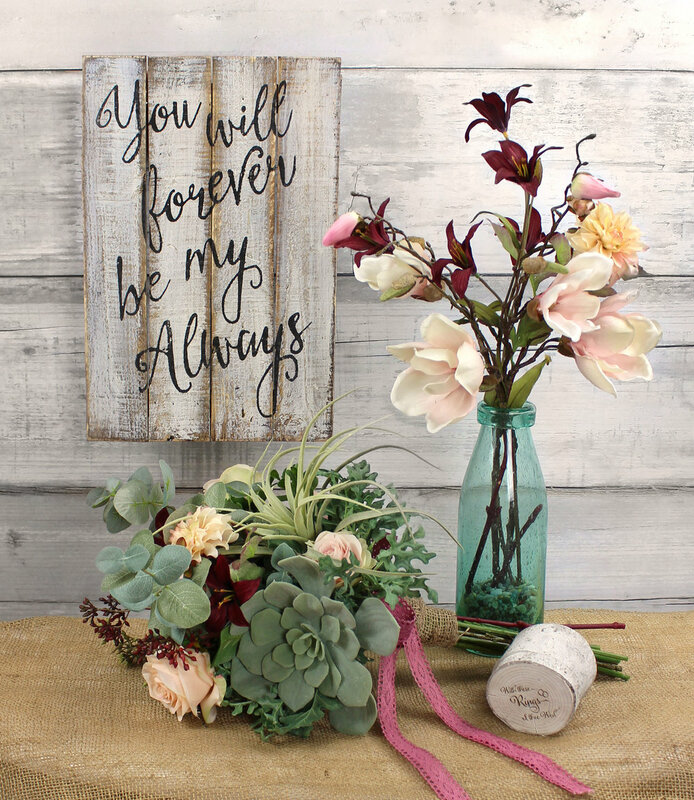 Wedding flowers are so much more than just the Bride’s bouquet. Obviously, the bride’s bouquet has a huge impact on her wedding day look but wedding day floral decisions extend much beyond. Wedding day floral decisions extend to the look of the wedding party and can be a major player in both ceremony and reception décor. Luckily, our professional floral members are here to help you find what you’re looking for and offer inspiration and options to fit your budget. Our membership encompasses a variety of professionals who can assist with fresh and/or silk floral in the Central Minnesota area. “This beautiful display of blush pinks and deep burgundy colors has been a big eye catcher! The mix of colors are very elegant and can be very natural as well! It seems to be a big trend for a lot of brides this year!” the Floral Team at Crafts Direct shared. “The blush pink palette is very popular again this year, but we're changing it up a little bit by adding a touch of burgundy and blue (believe it or not, that's exactly what the trend forecasters said would happen, and we doubted them!). Mixed metal colors are as pretty as ever. Not just mixing silver and gold, but shades and finishes of all different types of metals. Shiny, matte, textured, smooth, they're all combined for a really rich appearance,” explained Rhoda Paurus, of St. Cloud Floral. “Lavender has been another intriguing and popular trend! Lavender is easy to add as a great accent for just about any season!” according to the Floral Team at Crafts Direct. The Wedding & Tuxedo Connection agrees! “Green's, green's and more green's. Greenery has become very trendy for table décor. Adding pops of color with flowers and candles can spruce up the table. This is an example of a 10' garland of greens with pops of white spider mums, roses and babies breath. There is seeded euch in there. Seeded euch is also great for table décor when you just want a touch of green around say a lantern or tiered candles,” explains Jen. “To top the cake just add flowers! It's simple, easy and a fun way to personalize your cake and make it your own!” explains the Floral Team at Crafts Direct. For more inspiration, contact information for our professional floral members, and reviews from real couples, please visit: http://www.idoido.org/vendors?category=Florists#header_row_bottom.